The Plymouth red-bellied turtle is believed to be a subspecies of the Eastern red-bellied turtle (Pseudemys rubriventris). Some biologists argue that the subspecies only exists because of a taxonomic error, and that the Plymouth red-bellied turtle is only an isolated population of the Eastern red-bellied turtle. 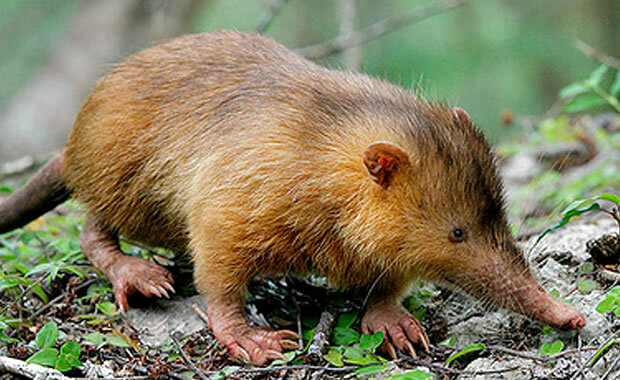 Nevertheless, the subspecies is classified as endangered throughout its entire range in Massachusetts. The Eastern red-bellied turtle is a shy pond turtle species. Adults grow from 10 to 15 inches in length. Their carapaces are brown to black with flat scutes. Their heads are arrow-like in shape with stripes that run between the eyes and to the nose. The plastron (undershell) is reddish in color, giving the red-bellied turtle its name. Males have long claws on their front feet. 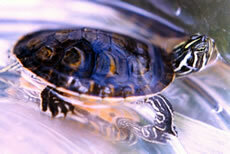 Eastern red-bellied turtles can be found in deep ponds, lakes, streams and rivers. They can often be found basking not too far from the water. Diet consists of snails, slugs, crayfish, tadpoles, and aquatic plants. Mating occurs in the spring, and nesting from June to July. Females lay from 8 to 20 eggs, and the hatchlings emerge 10 to 15 weeks later. The young turtles sometimes remain in the nest throughout the winter. In Massachusetts, these turtles are said to be very vulnerable (as eggs and young turtles) to predation by skunks, raccoons, birds, and fish, and the population was reduced to 200 to 300 turtles in the 1980s. Conservation efforts include preservation of the turtles habitat and protection of the nests. There are also several head start programs in place in Massachusetts to help raise hatchlings until they are able to survive on their own. Copyright Notice: This article is licensed under the GNU Free Documentation License. It uses material from the Wikipedia article "Plymouth red-bellied turtle". Glenn, C. R. 2006. "Earth's Endangered Creatures - Plymouth Red-bellied Turtle Facts" (Online). Accessed 4/24/2019 at http://earthsendangered.com/profile.asp?sp=763&ID=9. Need more Plymouth Red-bellied Turtle facts?